Man-made snow at Sun Valley. To most skiers and snowboarders in the Inland Northwest, snowmaking isn't something they think about unless it's the difference between a mountain being open or closed — in January. Snowmaking for area mountains usually means getting the slopes ready for the upcoming season. During dry years, like this one, snowmaking is saving the season for one Idaho resort. "We use snowmaking at Sun Valley to ensure great conditions. We like to be able to guarantee a great product," says Jack Sibbach, director of marketing and public relations for Sun Valley. He explains that every year, snowmaking is an important aspect of operations in Sun Valley: "We have four wells that we pull water from, 550 snowmaking guns between Baldy and Dollar Mountains, and are constantly looking at ways to achieve the level of snowmaking we have with more efficient systems." He adds, "We make snow for 640 acres on Baldy, with all green circle runs covered with snowmaking, and all of them are groomed as well." Sun Valley also makes snow for some of its black diamond runs, like Limelight, the signature run on the Warm Springs side. Earlier this season, Sun Valley was in a drought. Since that time, it's been receiving natural snow consistently and is opening more acres and bowls as the season progresses. "Snowmaking is important in average years, it is important in exceptional snow years, but it's even more important in low snow years," says Sibbach. "Snowmaking is important to the economy for the entire valley. We had a great Christmas. Hotels, restaurants and retailers all reported a successful holiday season, and we had no complaints on the quality of skiing. This shows how well the grooming and snowmaking departments are doing." Additionally, in nine of the past 10 years, snowmaking has ensured a Thanksgiving weekend opening for the mountain. The immaculate runs that make Sun Valley famous are carefully crafted between the grooming and snowmaking crews and the ski patrol. Sun Valley boasts one of the largest computerized snowmaking systems in North America. 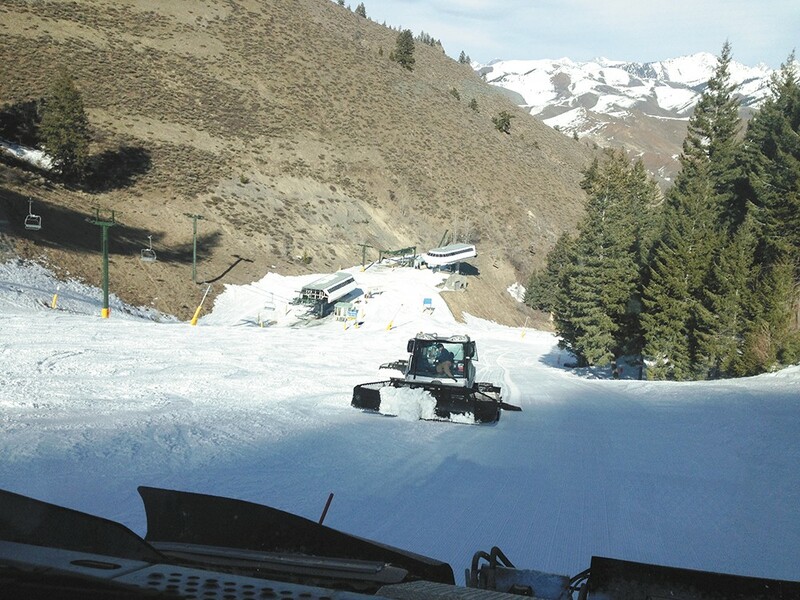 The well-equipped grooming fleet in Sun Valley features multiple winch cats and two "Beast" groomers with a tiller that is almost 2 feet wider than standard groomers, making for faster and more efficient grooming, enabling the team to groom more acres in less time. Ski patrollers play an integral part as well, as they're the ones on the hill, noting which areas and runs need snowmaking or grooming attention, which they report at the nightly operations meetings. Thu., April 25, 9 a.m.-6 p.m., Fri., April 26, 9 a.m.-6 p.m. and Sat., April 27, 9 a.m.-5 p.m.